A TRIO of lettings agents from Glasgow-based Cairn Estate and Letting Agency have undergone a series of training seminars on the latest lettings legislation to ensure that the firm is continuing to provide landlords and tenants alike with best practice professional advice. Whilst senior letting agent, Jacqueline Gray, attended a Landlord Accreditation Scotland course on dealing with deposits, letting agent, Annie Dunlay, attended a tenancy agreements and repossession course run by the same organisation, whilst head of lettings, Susan Collins, attended a Rightmove seminar designed to give letting agents an insight into the operation of the leading website and how it can benefit their clients. Enjoying its busiest year to date, Cairn’s lettings team has recently expanded to seven members of staff, following the recent appointment of Nicola McCarthy as a trainee letting agent. 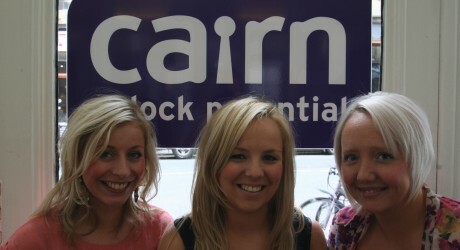 Cairn is much more than ‘just an estate agent’. In fact it is the only agent that sells investment properties, lets flats, penthouses, homes or student flats, adds value by undertaking repair works, has a database of clients seeking access to buy to lets and property portfolios and sources properties for clients, whether homes or student flats.